Pampilhosa da Serra River Beach and Praia da Luz were the "+ Accessible" in 2014. The Pampilhosa da Serra river beach, in the municipality of Pampilhosa da Serra and the Praia da Luz, Lagos municipality were distinguished in the 6th edition of the Prize “+ Accessible Beach” as the two accessible beaches that last bathing season . Getting to the beach of the Sierra Pampilhosa first and Praia da Luz in second place. The two beaches showed the best practices in terms of accessibility and quality conditions of the services offered to people with reduced mobility. The Award “+ Accessible Beach” rewards the two beaches that most distinguished themselves in the implementation of services and infrastructures accessible to people with disabilities. The winning beaches of each year must be present in the Project list “ Accessible Beach – Beach for all”. 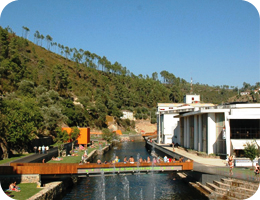 This award is decided by a jury consisting of: National Institute of Rehabilitation, presiding, Water Institute, IP, Tourism of Portugal, IP; Rescue Institute to Coastaway, Vodafone Portugal Foundation and Blue Flag European Association. “Accessible beach, beach for All” 2014 list. Next ›Como viajam de avião as pessoas com deficiência?